C.Q.M.S. William Sydney Longhurst. Coldharbour Soldier. Thank you to Jane Anthony, Andy Bailey and Mary Hustings for the following research. William Sydney Longhurst was the eldest son of William and Amelia of Row Mount, Coldharbour. At that time it was common to name the eldest son in the family after his father but they were known by their second name consequently he was known as Sydney. There were sixteen children in the family, five of whom served in World War One including Horace John who was also killed. Sydney was born on 12th November 1880, and was baptised at Christ Church. . The Longhursts are one of Coldharbours best known families, family members having lived, inter alia, at Squires Farm in Logmore Lane, Leith Hill Place, Cockshott’s Farm, Rowmount Farm, later Weald View Cottages, and Mosses Wood. William Longhurst senior was a gardener and by 1901 he was also the Parish Clerk. Sydney’s service number suggests that he enlisted in the Regular Army in approximately 1898, and to have to served in the First World War, probably extended his service beyond the normal seven years with the Colours and five years in the Reserve. By 1911 he had been promoted to Lance Sergeant and was at the Warley Barracks in Essex. At the outbreak of the war the 1st Battalion was stationed at Bordon Camp. He arrived in France on 19th January 1915. In April 1916 the 1st Battalion Queen’s was holding the line south of the La Basse Canal near the villiage of Cuinchy, an area known as ‘the brickstacks’. The war had taken it’s toll on the banks of the canal and the area was known to be exceedingly wet. The battalion war diary for the 18th April 1916 notes that the day was ‘a quiet day’ in which William Longhurst and Private G/4075 William West (from Dorking) were killed and two other men wounded. 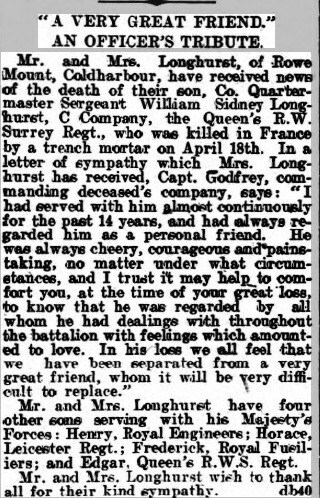 His commanding officer wrote that CQMS Longhurst was ‘a personal friend’, ‘always cheery, courageous and painstaking no matter under what circumstances’. 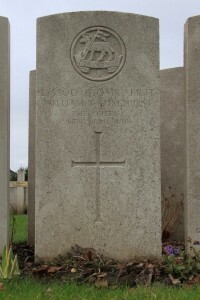 CQMS William Sydney Longhurst and Private West were laid to rest besides one another in the Bethune Town Cemetery, France. Sydney is commemorated on the Coldharbour village war memorial.